“20 Movie Scenes Before-And-After Special Effects.” shows you what it’s like to be an actor in Hollywood. 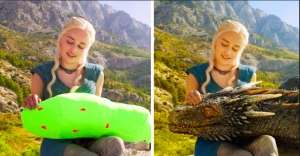 You sit stroking a lumpy stuffed toy but the movie viewer watching ‘Game of Thrones” sees a dragon. When we watched a port with ships coming in for “Boardwalk Empire” it’s really just a bunch of people milling around in front of a blank wall of green paper. Saves a lot on building stage sets.